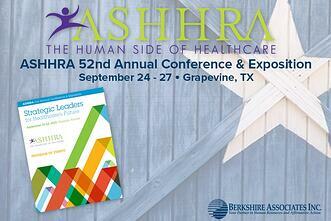 September 24-27, in Grapevine Texas, Berkshire joins HR professionals in the health care industry at the American Society for Healthcare Resources Administration (ASHRAA) 52nd Annual Conference & Exposition. ASHRAA is exclusively dedicated to meeting the professional needs of human resources leaders in health care. The conference is an oppurtunity for these professionals to enhance their healthcare knowledge, become aware of trends in health care HR, and network with other professionals. For more information about the event, or you would like to register for this event, please click here. We hope to see you there!